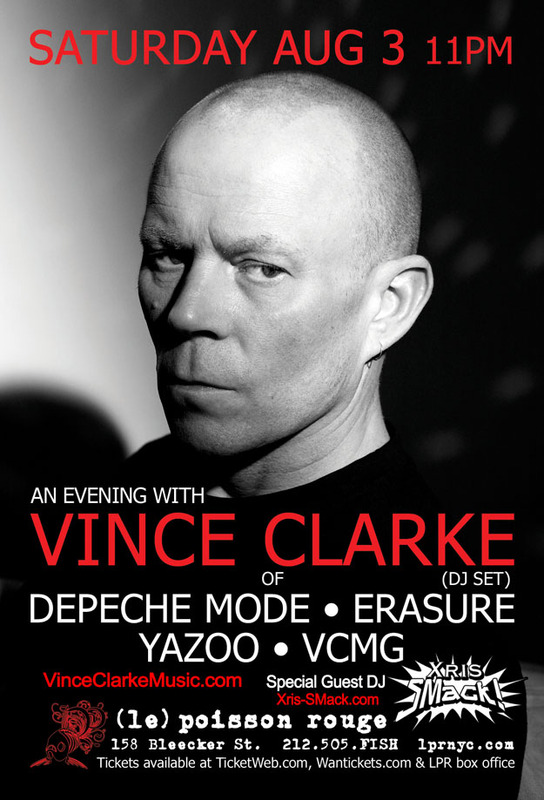 08/03/13 – VINCE CLARKE (of Depeche Mode, Yaz and Erasure) DJ Set + Xris SMack! VINCE CLARKE (of Depeche Mode, Yaz and Erasure) DJ Set + Xris SMack! Vince Clarke is an electronic music pioneer whose analog synths, samples and chilly beats have accounted for some of the most memorable chart-topping hits and toe-tapping dance grooves of the last three decades. He is a founding member of Depeche Mode and writer of many of their most seminal and beloved tracks the classic single “Just Can’t Get Enough,” cited by Rolling Stone magazine as one of the100 Greatest Pop Songs Of All Time. Yazoo (Yaz in the U.S.), is one of the first, and still most influential, male/female pairings in synth pop. Their two classic albums, “Upstairs At Eric’s” and “You And Me Both” not only set the standard for innovation in songwriting, composition and production in their own time, but pointed the way to the future for all the artists who followed in their wake. The 12” mix of “Situation” remains a benchmark in the history of dance music and virtually began the long love affair between alternative music and club culture. With singer and co-songwriter Andy Bell, Erasure have sold more than 25 million records and charted some of the most beloved songs of the past twenty years, from “Sometimes” and “Oh L’ Amour” to “A Little Respect, “Chains of Love” and “Always” among dozens of others.